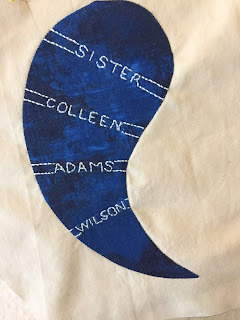 This is a continuation of the posts about the making of a quilt for my sister, Colleen Wilson. I had to take all the pieces off my design wall for a while so that I could catch up with my other projects. Wouldn't it be nice to have a huge studio, maybe even a barn like Nancy Crow? Then you could leave up all kinds of quilts in progress. Anyway, I digress. I got overwhelmed when I had piles of unfinished projects in my studio. There were piles on my sewing machine table, on my cutting table, near my quilting machine, and the design wall was covered. I realized that most of the mess was because my design wall was totally covered with this huge quilt I'm making for my sister. Eureka! 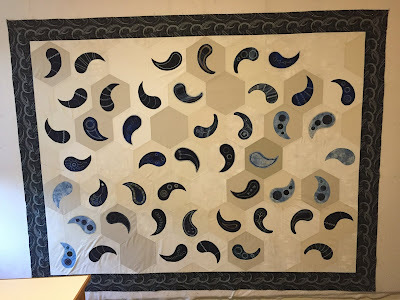 I was able to quilt the lap quilt, get the binding done on it; quilt the anniversary quilt and get the binding done; quilt another little piece and get the binding done; cut out a lightweight jacket, clear off all the paperwork that was piling up in my to-do pile; and DUST OFF all the surfaces. Whew. So back to my sister's quilt, now that my studio and mind were cleared. I've finished appliqueing and embroidering all of the paisley pieces - 49 in all. I embroidered her name on one of them (I wonder if she will see it?). With a hexagon quilt, it is always a little interesting how each quilter decides to finish off the edges. Meaning, leave it as a hexagon shape, or fill in with fabric to get it squared up, or cut off the pieces to square it up. I decided to fill in the spaces with off white fabric, then add a colorful border. I found an interesting paisley fabric that was mostly blue, and one that was mostly off white. So I used the mostly blue one to add borders and the mostly off white one for the backing. Here is the completed quilt top. It's off to my long arm machine quilter for basting. Then it will come back to me for the quilting on my sit down long arm. (It's so big, I couldn't get back far enough from my design wall to get a square shot).